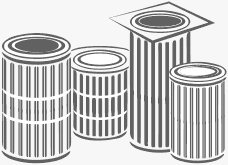 DAMN Filters - Industrial filters and parts for dust collectors. No results? Give Deep Search a try. Don't know the part number? We'll help you identify	it. Great alternatives for OptiFlo RC and other AAF filters. We've got the old TDC filter cross reference you've been looking for. In air cleaning technology, HEPA filters are ultimate filtration. We source great deals from suppliers on brand name HEPAs or provide replacements of equal efficiency from stock. Solenoid & diaphragm valve repair kits and pulse valves from Asco, Goyen, Mecair, Turbo, and Tae-Ha. Ducting industrial fitration equipment can be a hassle. We have a solution. Let our engineers help design and spec your ductwork project. No obligation. Huge industrial supply of compressed air filters, sperarators and coalescing filters. From, Atlas Copco, Gardner Denver, Solberg and Sullair to name a few. The 'little stuff' you may need. Filter Precoat, Edge Gaskets, Minihelic Filter and Magnahelic Filter Gauge Kit. We manufacture quality dust collector filters in the USA. If we don't have it in stock we can make it in 5-10 days. If you can't find your filter call us at (844) 605-3266 or message us. We'll find it, or cross it! Orders of 12 or more filters qualify for the Name Your DAMN Price Offer. Filtration experts are here to help. Call (844) 605-3266 or write. Go with the flow! Replacement filters from 100's of OEMs. What's the condition of your damn filters? Our test kits can help. Featuring solenoid valves, diaphragm valves, and repair kits. HEPA and other high-efficiency filters for industrial use. Track down those hard-to-find parts using our deep search.